Born in Casablanca on June 12th, 1913, Maurice Ohana received nearly all of his musical training in France, while pursuing his classical studies at the same time. For a while he moved towards architecture, which he later abandoned in order to devote himself entirely to music. While still very young, he started as a pianist in the Basque Country where his family settled. His career looked promising until the breakout of the war not only took him far from the musical world, but led him to Rome where he became the pupil and friend of Alfredo Casella at the Sainta Cecilia Academy. Once discharged, he came back to settle in Paris in 1946. At this time, his first works were becoming known in France. With three friends, he founded the “Groupe Zodiaque” whose purpose was to defend freedom of expression against the dictatorial aesthetic attitudes then in vogue. He made the manifesto of these youthful combats his own and has carried them on until the present time. Profound trends appear in his work. From Llanto por Ignacio Sanchez Mejias (1950) through his recent works, the development tends towards a rigor oddly associated with a great freedom of style, in his compositions as well as in his relationships with the performer. Resolutely separate from the dodecaphonic and serial movements, Maurice Ohana has none the less pursued a revolution in widening methods and exploration of sound as well as the resulting forms. Faithfull to his Andalusian origins while broadening their musical essence to universal dimensions, Maurice Ohana has progressed towards a synthesis where one finds the pursuits and concerns of today’s music. First of all, he liberated the range from its diatonic constraints ; he strained to release rhythm from the barrier of tempo, and he brought vocal techniques back to their original power, pulling them away from the grasp of bel canto. A pianist from childhood, he has maintained a predilection for this instrument. 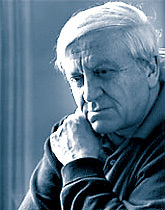 He has also contributed to enriching various instrumental domains, particularly percussion in works such as Silenciaire, the Quatre études, which have become classics, pieces for the new ten-string guitar, or vocal works such as Office des oracles for three vocal and instrumental groups, Cris for 12 voices and Sibylle for voice, percussion and band, which reveal a resolutely innovative temperament in all fields of sound. As from 1976, an uninterrupted series of large scale works such as Anneau du Tamarit for cello and orchestra, the Messe, Trois contes de l’Honorable Fleur, a chamber opera, Livre des prodiges for full orchestra, Douze études for piano, etc., have led to La Célestine, a large scale opera summing up most of the composer’s previous experience. La Célestine, based on a XVth century Spanish play by Fernando de Rojas, was premiered at the Paris Opera (Palais Garnier) on June 13th, 1988 with considerable acclaim, both from audiences and the international press. More works, choral and orchestral, have followed in subsequent years amongst which a cello concerto, In dark and blue, which was premiered by Mstislav Rostropovitch and Seiji Ozawa, bearing witness of an exceptional creative vitality seemingly flawless. The latest born of these, Avoaha, for choir, 2 pianos and 3 percussions, has been again hailed as an exceptional event. Maurice Ohana has no students and has never taught. However, he can be located in the center of a group of young composers who come from different origins, whose work he followed for a long time and whose orientation, in affinity with his own, confirms the validity of his original options. Among these are Félix Ibarrondo, Ton-That Tiêt, Edith Canat de Chizy, Francis Bayer, André Bon, Guy Reibel and Nicolas Zourabichvili de Pelken. Maurice Ohana received the Italia Prize in 1969, the National Prize for Music in 1975, the City of Paris Musical Prize in 1983, the Honegger Prize in 1982 and the Maurice Ravel Prize in 1985. He is Commandeur des Arts et des Lettres and Chevalier de la Légion d’Honneur. In 1991, he was awarded the Guerlain Prize for Music by the Beaux-Arts Academy. In 1992, he received the SACEM Prize for the best contemporary work for his concerto In dark and blue. Maurice Ohana died in Paris on November 13th, 1992. Maurice Ohana was awarded the first prize of the “contemporary music composer of the year” at the first “Victoires de la Musique Classique” in 1994. -CD release: Cantigas for mixed choir and instrumental ensemble, by the company La Tempête, under the direction of Simon-Pierre Bestion, for the label Alpha Classics - Alpha 261. 1. Vinyl recording B.A.M. 5.863. 1. Vinyl recording Erato 70.513. 1. Vinyl recording CBS 30 A 064. 6. Othersvinyl recordings P.R. 157 128, R.S. 9014-5, VSM 2178. 7. CD recording ASTRE 8513. 4. CD recording ASTRE 8513 by S. Schmidt. Anonyme XXe siècle, for 2 guitars. CD recording REM 311206 X CD. Guitars : Jean-Marie Tréhard et Jean Horreaux. CD recording Timpani IC 1044. CD recording Timpani IC 1039. 1. CD recording Calliope 9877. 2. CD recording Accord 202482. CD recording Vérany PV 787032. Chœur contemporain et Les Percussions de Strasbourg.